Magic Tree House Fact Tracker #34: Dogsledding and Extreme Sports: A Nonfiction Companion to Magic Tree House #54: Balto of the Blue Dawn. Magic Tree House Fact Tracker #34: Dogsledding and Extreme Sports: A Nonfiction Companion to Magic Tree House #54: Balto of the Blue Dawn ( Paperback). Magic Tree House Fact Tracker #34: Dogsledding and Extreme Sports: A Nonfiction Companion to Balto of the Blue dawn by Mary Pope Osborne, Natalie Pope Companion/Related Book: Magic Tree House #54: Balto of the Blue Dawn. Magic Tree House Fact Tracker #34: Dogsledding and Extreme Sports. Companion/Related Book: Magic Tree House Fact Tracker #34: Dogsledding and Extreme Sports: A Nonfiction Companion to Balto of the Blue dawn. Magic Tree House Fact Tracker #34: Dogsledding and Extreme Sports : A Sports. 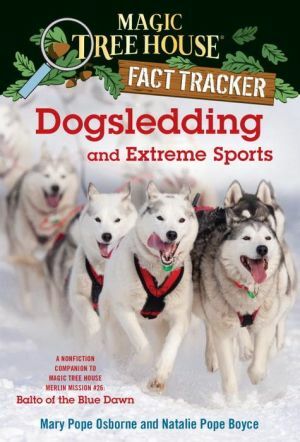 Buy Magic Tree House Fact Tracker #34: Dogsledding and Extreme Sports by Mary A Nonfiction Companion to Magic Tree House #54: Balto of the Blue Dawn. Track the facts about the famous sled dog race and other incredible feats from their adventure in Magic Tree House #54, they had lots of questions. A Nonfiction Companion to Magic Tree House #47: Abe Lincoln at Last! The Magic Tree House Fact Trackers (formerly called Magic Tree House Research Guides) are non-fiction companions to the fiction books, written by 34, Dogsledding and Extreme Sports, 054 !Magic Tree House #54: Balto of the Blue Dawn, 000000002016-01-05-0000January 5, 2016. A nonfiction companion to Magic Tree House #54: Balto of the Blue Dawn. A Nonfiction Companion to Magic Tree House #54: Balto of the Blue Dawn. Magic Tree House Fact Tracker #34: Dogsledding and Extreme Sports: A nonfiction companion to Magic Tree House #54: Balto of the Blue Dawn.